One day my daughter was sick and stayed home. In the afternoon we made a little walk around the neighbourhood, which is a city neighbourhood with lots of grocery stores, shops, and bars. It was spring and still cold and rainy. We walked past a bakery with had put a sign out. 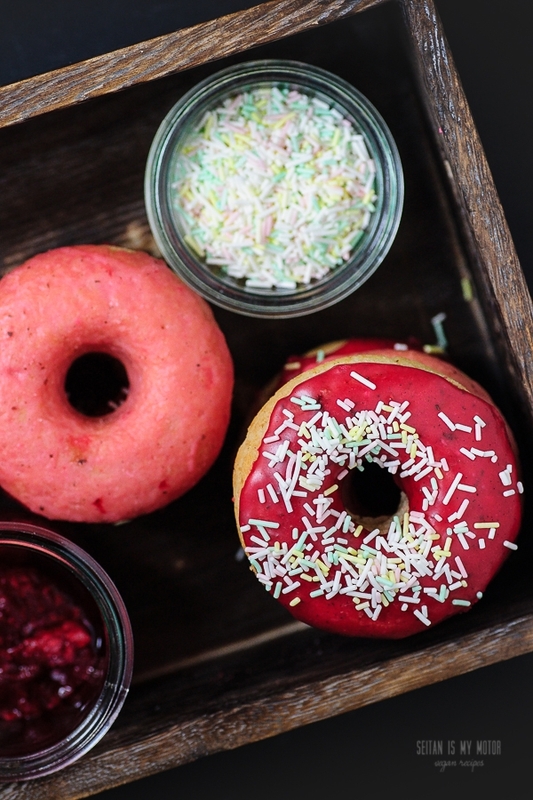 It pictured a couple of doughnuts, all in different bright colours. When F. saw the sign she begged me to buy a batch. The bakery was one of those chains with self service and products made with much more than flour, yeast, salt, and water. Germany has come a long way with its bakeries, but it’s not a good one. Discounter stores with self service are popping up everywhere and their products are so cheap that they can’t be made in a bakery where employees are paid decent wages. Instead of quality you get a jamboree bag of enhancers and preservatives. These baked goods don’t keep fresh very long and taste pretty bland, but they can be produced quickly and without skilled employees, I guess. I didn’t want to spill all that over my kid, so I pulled out my second argument and mumbled something about “crushed bugs” in the glaze and asked her if she wanted to make her own doughnuts instead. After that I immediately thought, “Damn, why did I say that? Doughnuts take time and patience.” Even if I sometimes have these character traits, my doughter definitely doesn’t know what they mean. Ah, well. Sometimes I am my own little discounter store. I like shortcuts, too. So I decided we should pull out the doughnut pan and make some baking powder leavened baked treats instead of yeast leavened deep-fried ones. I used a simple muffin recipe as a base and for the frosting I cooked some raspberries, strained the juice and mixed it with powdered sugar. These quick fix donuts are not comparable to their fried counterparts, but my daughter still thought they were perfect. Since all kids love bright colours, these would be great for any kind of children’s (birthday) party and we will probably make them again. And even if you’re not a kid, you deserve bright colours and a little sugar, too. Note: The colour of the glaze can vary a bit. For some reason mine came out very bright red the first time I made these. The next time the glaze had more dark pink shades. So if you want red instead of dark pink, use frozen (or fresh) red currants or strawberries instead. The light pink version that you can also see in the pictures was made by thinning the glaze with some lemon juice. Grease a 12-hole doughnut pan and preheat oven to 180°C (350°F). To make the doughnuts, combine all dry ingredients in a bowl and mix well. Add liquid ingredients and stir until most lumps are gone. Pour into the prepared pan and bake for 25 minutes or until an inserted toothpick comes out clean. Let cool for 5 minutes, remove from the pan and let completely before applying the glaze. For the glaze, place berries in a small pot and cover with a lid. Cook for about 5 minutes or until the raspberries have broken down. Drain the berries and reserve the juice. Add 2-3 tablespoons of berry juice. Start with 2 tablespoons and stir to see if you've reached the desired consistency (silky and pourable, but not too thin) and add more liquid if necessary. 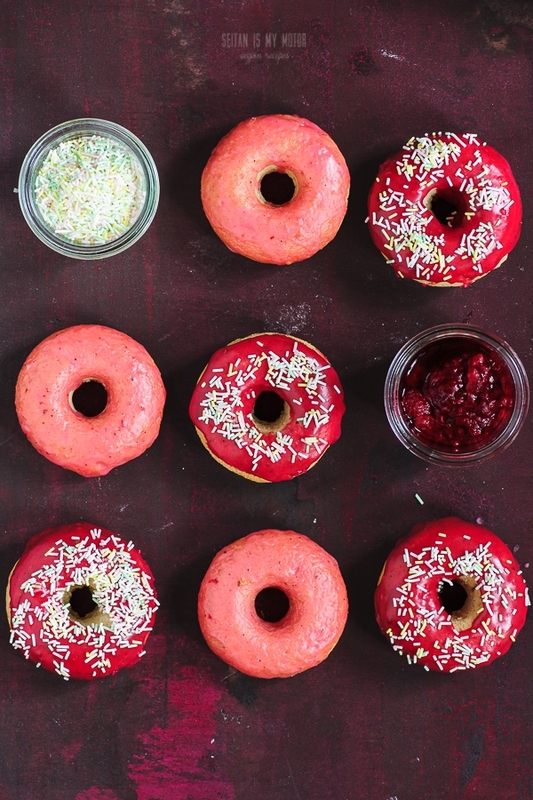 Brush the doughnuts with the glaze, coat with sprinkles and let dry completely. Beeren geben eine traumhafte Farbe – die sehen richtig klasse aus! These look so lovely, I love the variation in the pinks – they look great together! 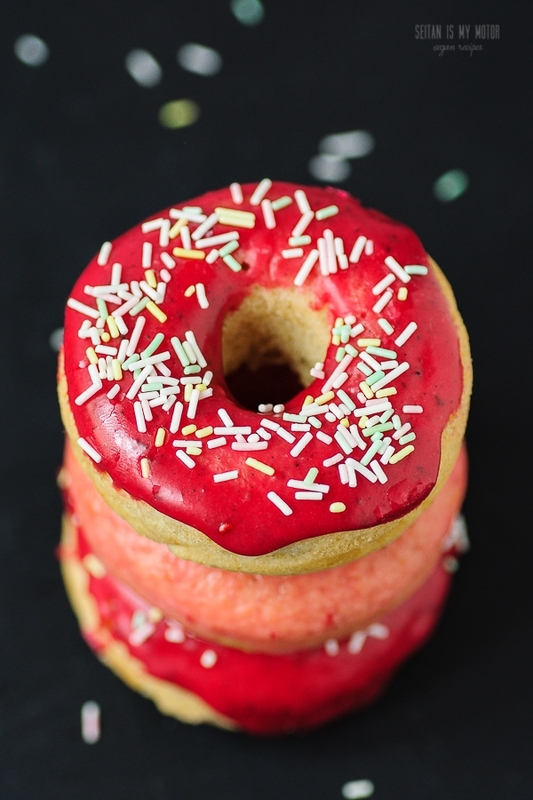 Pink doughnuts have always been my favourite, despite the fact that I am not at all a pink person. There’s a Friends of the Earth cafe near my work that stock pink sourdough doughnuts, sometimes I take myself up there for a treat. I have thought about getting a doughnut pan, I don’t know how much I would use it but these pictures really make me want to. 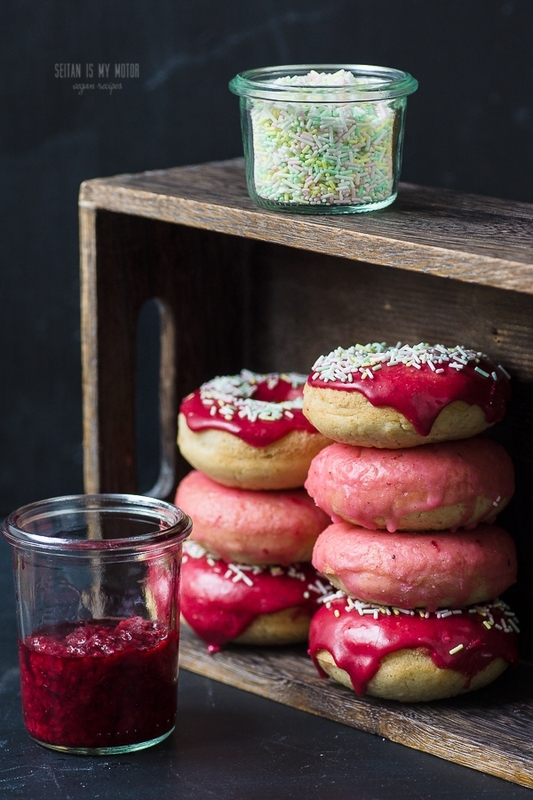 Your doughnuts look gorgeous and I am sure kids would fall in love with them. Your post makes me a bit sad because I remember loving the bread on my visit to germany. I think that it would be good to talk to kids about the time needed in making such baked goods and explain that not only do we need patience to make them (even with baking soda) but also that kids need patience to wait for them and not expect them to just drop in their lap any time they want them – which is one of the problems with those discounter stores. I know that my own little girl needs to understand patience and delayed gratification! And you are absolutely right! I always try to teach F that bread and all other food just needs time. Thank you, Melissa! I don’t often use my doughnut pan but it was really worth the purchase. If you cannot find one, you can make muffins instead. They’ll look awesome with a pink glaze, too. Those look so pretty! I always come here when I want to look at some of the best looking vegan food photography on the internets.